I am thrilled Karen requested my food adventures for her blog. I thought I’d read and cooked nearly everything at my disposal, until I read French Kids Eat Everything. Our family menu and eating habits have been forever changed. In my life B.C. (before children) I was a Critical Care Nurse turned Neuroscience Researcher. After our 2 daughters were born, I decided to throw my Passport in a drawer and focus on kids, cooking, crafting, and comedy. I grew up eating whole foods in the cornfields of Indiana, so it wasn’t until my own children started school that I realized how much America’s diet had changed. My mission is to teach my family that delicious food IS healthy food, and I blog our (sometimes hilarious) learning curve at Wisdom Comes Suddenly. Enjoy reading, and I’d love your comments! I found this food preference odd, because my children are adventurous eaters. Upon turning my back on Kelly at 10 months of age, she grabbed and devoured my taco. Sara has never met a fish she didn’t like, referring to them by their predominant colors. “Pink fish for dinner? YES!” Vegetables have rarely represented a challenge, primarily because we’ve never indicated they were something to be despised. So this entrenched dislike of “salad” became my kitchen gauntlet; I had to overcome their distaste for lettuce. I started by asking them to play Sous Chef at dinner prep one evening, giving them a bright pile of spinach to stem and tear. When I turned back from the sink, their faces were buried in piles of “salad”, as they ate little pieces of spinach off their cutting blocks. Two ideas struck me: (1) Maybe they like green leafy lettuce, and the dressings are too strong, and (2) perhaps I wasn’t chopping the lettuce into small enough pieces. To experiment, I started packing undressed spinach salads with almonds and mandarin oranges in their lunch boxes. They ate every bite, explaining it was “spinach”, and not “salad” whatsoever. My daughter, Sara, began requesting her weekly “Spinach Parfaits”. I began to see the light at the end of the salad tunnel. The following summer I read French Kids Eat Everything, and was introduced to the concept of tweaking flavors into graduated steps, enhancing children’s desire to embrace new foods. As much as I love to cook, and as many new recipes as I introduce to our family, this idea of “taste education” was completely novel to me. Emboldened with new knowledge, I stair-stepped my daughters to wilted spinach spaghetti, spinach and sweet sausage lasagna, and finally, the piece de resistance, creamed spinach. I began asking more questions when they didn’t like a particular recipe. What don’t you like: the texture, the smell, the appearance, or the other ingredients? This inquisition encouraged my kids to explore the depth of food and food combinations. Through this process, we discovered Kelly actually did like soup, but didn’t enjoy the texture of celery, representing a huge breakthrough for her (the one person who didn’t like soup in our soup-o-phile home). It was also through this process that I confirmed my daughters found dressing to be “too spicy”, and lettuce “too hard to get on a fork”. Our favorite family salad evolved more organically. I discovered I loved the lightness of white balsamic vinaigrette paired with radishes one night while eating at my favorite hole-in-the-wall Italian restaurant. My husband, Greg, asked me to incorporate red cabbage into a dish, because he liked the color. Green lettuce appeared to be the freshest lettuce in the produce case the summer of my “salad war”. 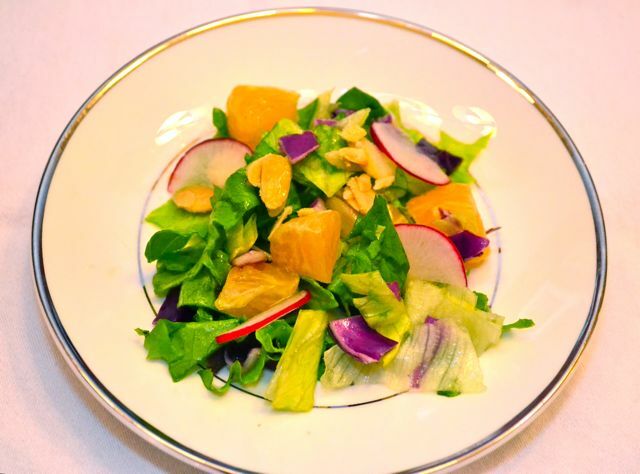 The girls have always loved mandarin oranges, and I often incorporate almonds toasted in sugar in my holiday salads. One night these influences crashed together into what is now called “Kids’ Salad”, because it was the magical night my children took a bite, then another, then another, and in a very Green Eggs and Ham style of speech, declared they loved salad, oh indeed they do. The following is our personalised recipe; why don’t you try to invent your own? 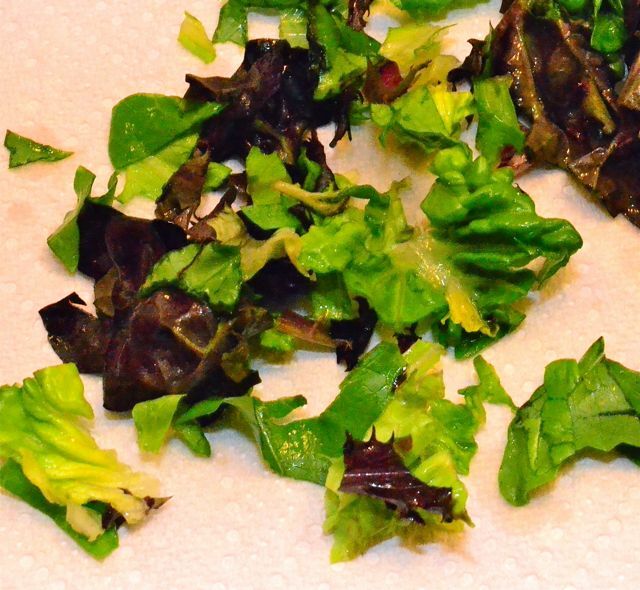 Chop the lettuce into small pieces (about 1-2” in diameter) and rinse. While the lettuce is drying, put the almonds and sugar in a small frying pan, and toast and stir them on medium to low heat, just until they are light brown and the sugar melts. Separate onto wax paper for cooling. Toss all ingredients right before dinner. These measurements should allow for the recipe to be made twice in one week, or incorporated into lunchboxes. I was prepared for my children to pick at the cabbage and radishes, which they did with great skill, for at least 3 months. Last week my youngest daughter Kelly, while sitting through a formal dinner during a holiday outing, grabbed a raw radish off her plate and bit into whole. Momma victories are small, but no less sweet. Mix in a lidded container and shake well. Chill for 30 minutes before serving. -Mandarin oranges are the same as tangerines (or Clementines, as we call them during the Holidays), and I use both canned and fresh, depending on what I have on hand. -For families who do not eat sugar, honey can be substituted in the alternate vinaigrette below, and the almonds can be toasted plain, left untoasted, or slightly warmed with just a bit of honey. -This recipe evolves weekly at our house, depending on the freshest greens available. Iceberg is an easy base, because it’s affordable and plentiful, and gives the salad a nice crunchy texture. I use spinach, Artisan, Savoy Cabbage, or Romaine, when the store is out of Green lettuce. – Dressings are a family preference. I’ve successfully used Poppyseed and an alternate vinaigrette which includes sugar which can be substituted with honey. Bon Appétit! I’d love to hear about your family’s reaction to this salad – or your own recipe if you have one! Wait – your store was out of green lettuce? Whoa! I sometimes have trouble finding iceberg bigger than a tennis ball but resort to buying an always-available bag of green lettuce. I don’t like having actual fruit on my salad – or touching my salad dressing at all – but we eat something similar and use a splash of OJ to sweeten the vinegar. For a crunch, a friend suggested toasted unseasoned dry ramen or lo mein noodles – I know some of your blood pressure just went up reading that but it seems to add something to make it more filling if it’s your main dish. Yea Lori!! Bravo! Well deserved kudos to you!